This past fortnight we (Rowan, Ginevra and I) got up to many more planning elements of the Saxony outfits. I had a go at drafting a pattern for my caul. By looking at many portraits, I devised an idea that involved altering a pattern I know does work for me: my 16th century caul pattern. 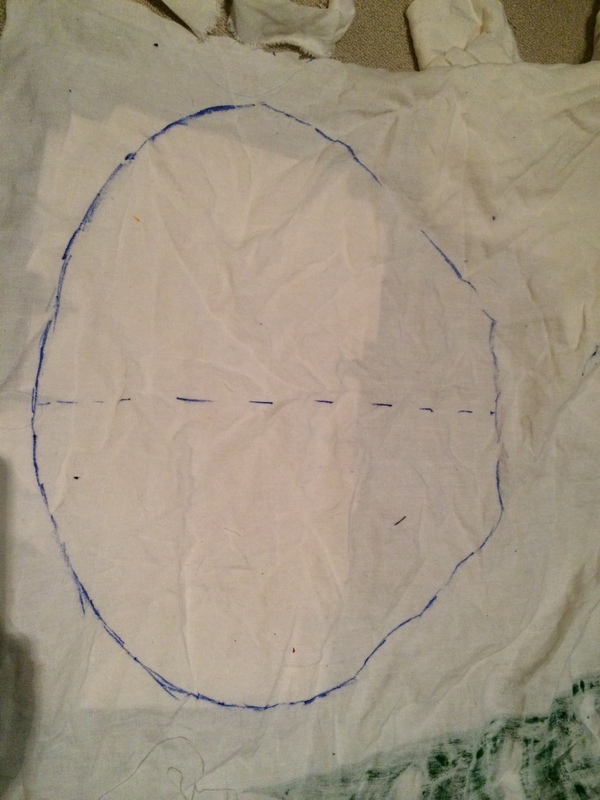 This 16th century caul pattern is a perfect circle. I hypothesised that making the circle more like a rounded triangle shape would get the 16th century Saxony look (flatter on the top with distinct gathering towards the ears, see Figures 1 and 2). 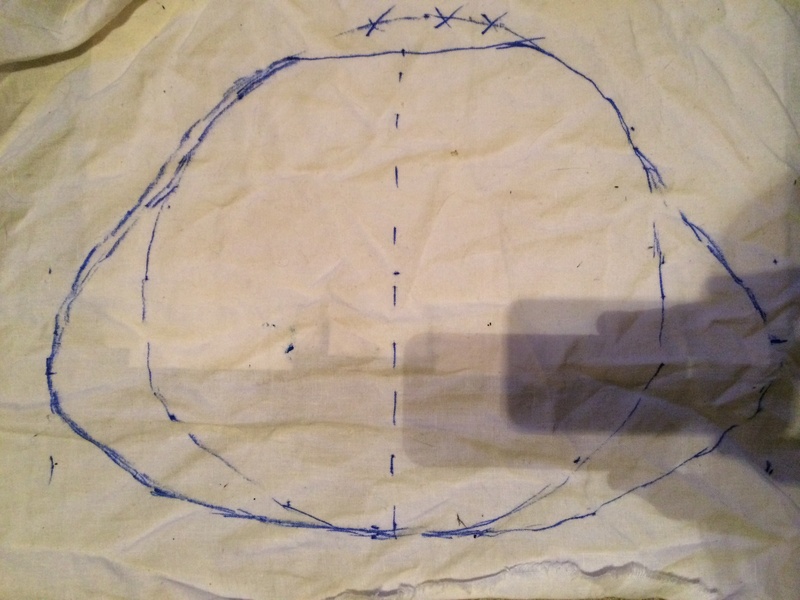 Figure 1: Caul mockup one – the 30cm circle is from my Italian caul pattern. I flattened the top (that sits on the forehead) and made the sides triangular. 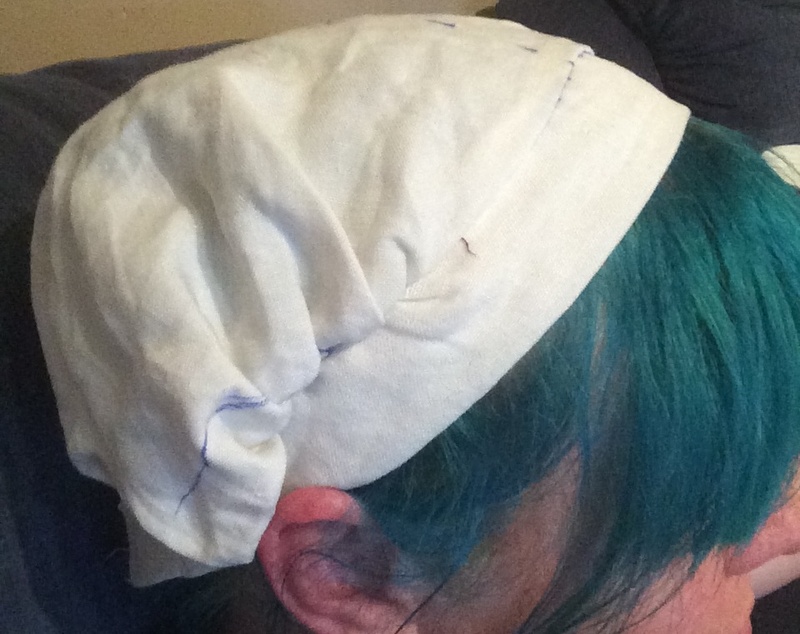 Figure 2: Caul mockup one – the side view of me (Ceara) shows that the top is sitting flat, like I was aiming for, but the band is a little thin and the sides/bottom don’t have enough pleating to sit out properly. Unfortunately, the banding width was a little too small, and there wasn’t enough material in the pleating at the bottom. My second mockup pattern (Figures 2-6) was much better – I added more bulk to the sides and bottom, which pleated up much nicer. Given that the actual caul will be made of two layers of material (instead of one, as in this mockup pattern) it should sit out more once it is made bulkier. In this second mockup pattern, however, the band was a little too wide. Figure 3: Caul mockup two – I traced around the pattern from mockup one and extended the sides and bottom of the pattern (that will sit at the nape of the neck). Figure 4: Caul mockup two – the second mockup pattern, which is kind of like a teardrop shape with the top cut off. Figure 5: Caul mockup two – front view of me (Ceara) shows that the pattern is sitting relatively flat on the top, and puffs out at the bottom (more like the portraits). 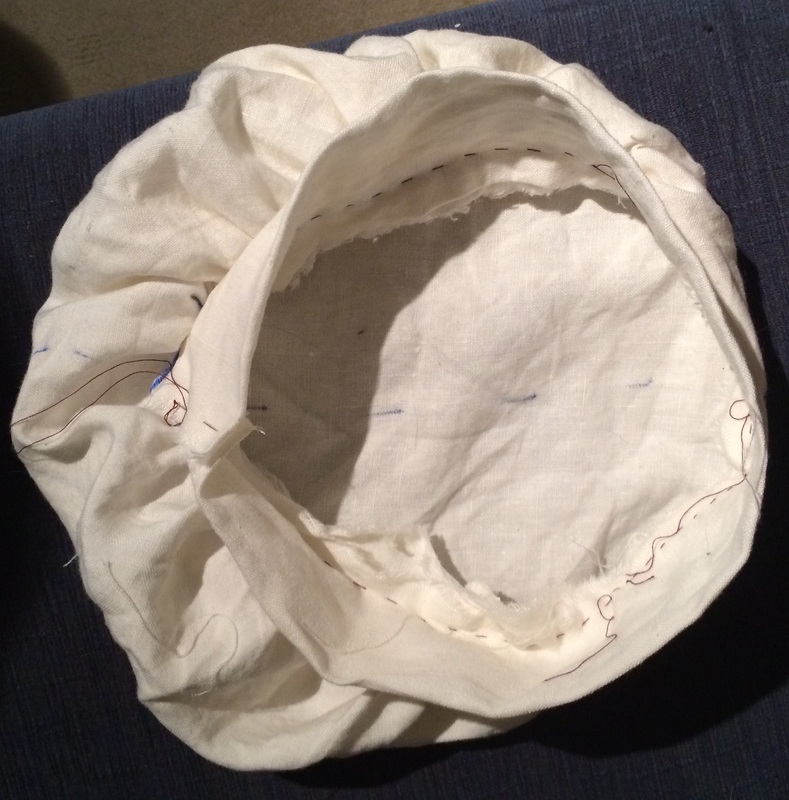 Figure 6: Caul mockup two – the underside of the pattern, showing how the band is off centre (sitting high), allowing the bottom and sides of the caul to puff out more (like in the period portraits). A third, neater mockup pattern was drawn from pattern mockup two and will be tested in the near future. It was also used to estimate that half a yard of brocade would be ample to make the real thing. Following on from Update 2, the paper pattern was cut up into the bands that had been labelled B1-B4 and C1-C3. A neat trick to keep the bands as even as possible is to cut from the ruler-measured edge of the pattern (in my case, where the labels are) as this is the most accurate measurement. 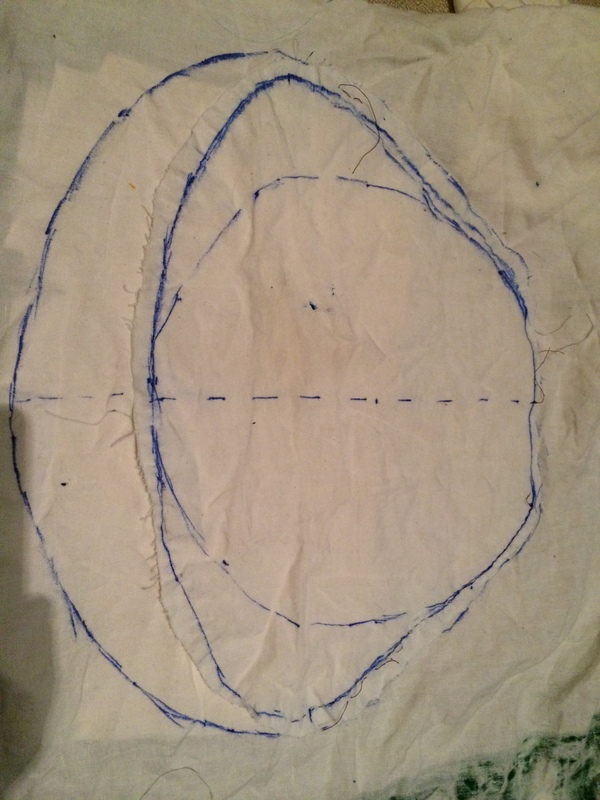 As you cut the band, fold it over, line it up carefully along the bottom edge and use it as the guide for cutting the rest of the band (even if it deviates from the lines you drew using the pencil and string technique) – see Figure 7. Figure 7: Cutting out the skirt pattern bands. The trick to keeping the bands as even as possible is to fold the band back on itself as you cut, using the already cut band as the guide. 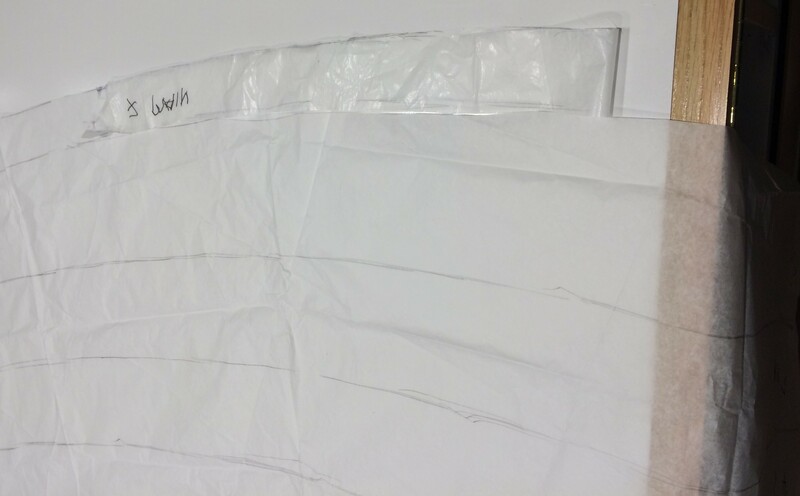 The fabric to be purchased comes 44” (~112cm) wide. Therefore, to estimate the fabric required for purchase, we marked out a space on the cutting board that was also this wide. Taking the piece C1, we folded it to fit within the 112cm width, leaving roughly 1cm around the pattern for seam allowance. The result showed that three widths of the C1 band were required for this pattern piece, and given that the pattern piece represented half of the skirt, the total was really six widths. Writing the measurements for each band, we repeated this process for each band and deduced that I would require a minimum of 230cm to make the bands. We also estimated that I’d need another 20cm for the matching brustfleck, bringing the total of the rust red silk brocade I need to source to 2.5 metres. We also placed the caul pattern on the cutting board within the 112cm width and determined that it will easily fit within half a metre of the gold silk brocade I need to source to make it with. 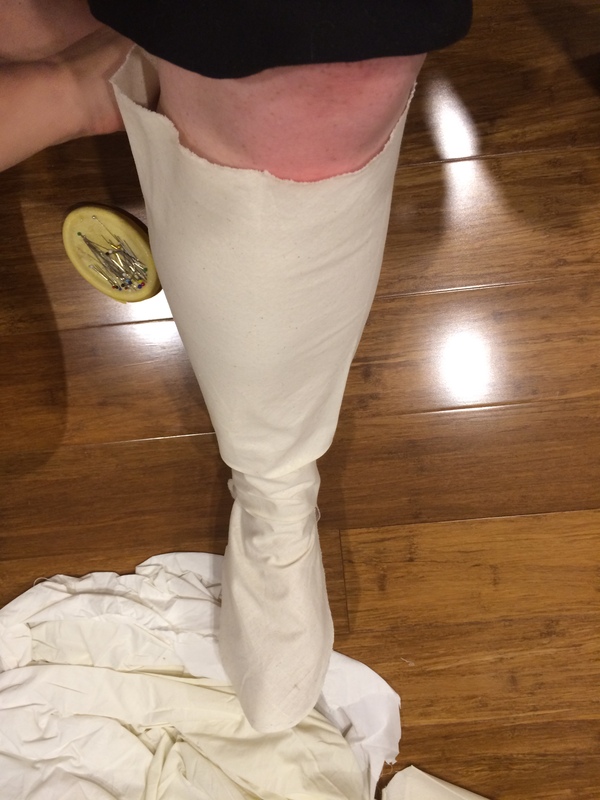 Using a 16th century hose pattern (references to come) that was drawn for someone else, Rowan helped me adjust it to roughly my foot/calf size (Figure 8). 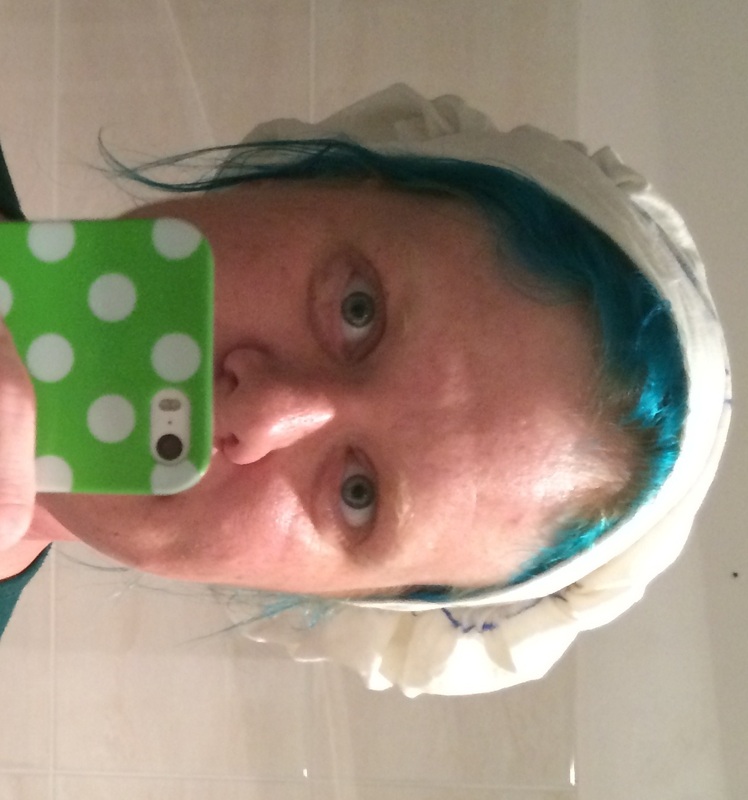 Mock-up this pattern over the next fortnight and adjust it to fit me firmly. Use linen or wool twill as the base fabric – either way, the material should not be too thick as it needs to breathe. Cut the pattern out on the diagonal so the fabric stretches. Make the pattern fitted, but not so fitted that I can’t get into it (i.e. leave some space in the ankle area). Flat fell the seams for linen, or overlap (not fold) seams for wool (as they will felt together with wear). Figure 8: My (Ceara’s) foot modelled in a 16th century hose pattern. The toe needs to be elongated, the calf tightened, and the length increased (so it can be folded down on itself).